Who comes to see the World’s Biggest Beagle? Today our visitors included two gents from Scotland on a whirlwind drive across America, a car full of young folks from Pocatello, a couple from California, a truck driver & his wife on vacation from Nampa, a guy from Nevada returning home after attending a Univ. of Idaho Vandals football game (UofI won! ), a geocacher, and pug owners from California. Some came because seeing the World’s Two Biggest Beagles was on their agenda; others were drive-by drop-ins. Miffy came from Chicago recently with his human parents, Nisha & Sascha, who have been teaching in America for about five years. After reading an article about Dog Bark Park in the Chicago Tribune they planned a vacation to Idaho to include a two-night stay in the big beagle. Miffy and Sprocket, our resident golden retriever and ambassador-in-training at Dog Bark Park, enjoyed some spirited play together. 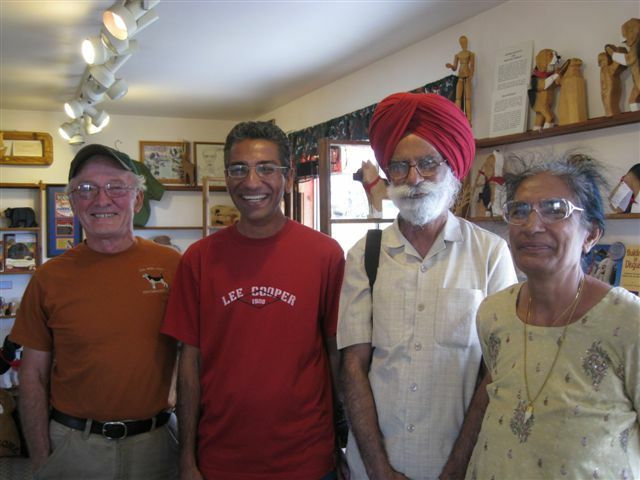 Our first guests from India also visited recently. Vikram & his parents were travelling around western US & he went to great lengths for the visit to Dog Bark Park to be a total surprise for his folks. Dennis & I enjoy helping to plan surprise or special occassion visits for our guests. Recently an Austrian magazine published an article about architectural wonders around the world. Included was a photo of Dog Bark Park sandwiched between images of Pisa, the Eiffel Tower & the Roman Coliseum. Never would we have imagined to be in such esteemed company! What a novel idea! There are many Beagle as well as dog lover’s out there. Everyone who stays here must come away smiling!